Sampson is a 2. 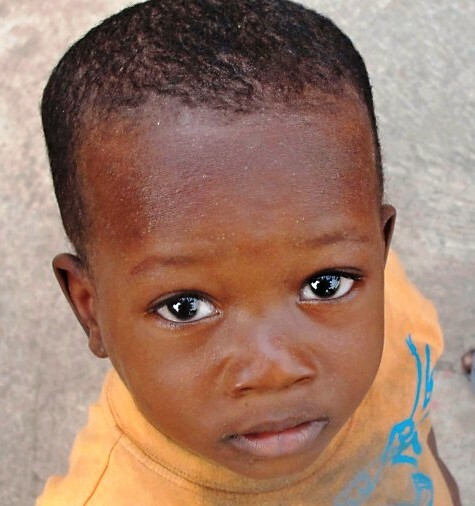 5 year old little boy currently waiting for a family in Ghana, West Africa. He has been legally cleared for adoption by the appropriate authorities. Sampson is HIV+. At this time, we do not know to what level the virus has affected his health. CD4 count/percentage and viral load are hard to get in Ghana, but we are working toward that end. Sampson is also a sickle cell carrier. Sampson has a minor special need in his rectal area, which makes it difficult and painful to potty. He will very soon be under the care of an HIV/AIDS specialist in Accra, Ghana, where he will receive competent care until his adoption is complete. Sampson needs a family who has a completed homestudy and is prepared to take on his special needs. He is a smart little boy who has had a very rough start to life. He is currently living at Eban House Foster and Rehabilitation Center in Teshie, Ghana–a very good child care facility with high staff to child ratio. Right now Sampson is a bit lost, and a bit sad. His whole life has changed in the last few months. We wait expectantly for the day when he will “blossom” into the joyful and energetic child he was meant to be! Families who have visited Eban House since Sampson’s arrival have been very taken with this exceptionally beautiful little guy. Sampson can be adopted through Adoption Advocates International. Couples must be between 25-50, and 21 years older than the child they intend to adopt. Families with 0-6 children can adopt. At least one short trip to Ghana is required (by at least one parent). The process from referral to homecoming in Ghana is typically 5-8 months. For more information, please contact Anita Gillispie at anita@adoptionadvocates.org or 918-960-2676.